Unique daily moisture care, for protection against heat styling & environmental damage. Adds strength, detangles & enhances curls – a great styling aid. Anti-oxidants and herbal extracts including anthyllis, certified organic lavender & vitamins work in synergy to protect hair from the elements whilst replacing moisture. Excellent to protect the hair from environmental damage. Helps replace hair moisture, strengthens hair & has colour protective ingredients. Anthyllis flower extract – to help protect the hair against heat styling & environmental damage. Certified Organic Lavender essential oil – to soothe the skin & mind. Detangler from GMO free rapeseed oil - Highly effective yet low irritant. Coconut glucoside – gentle deep pore cleanser to improve help hair strength & manageability. Suitable For: For all hair types, particularly good for dry & textured hair to increase body and aid styling. Aqua (Water), Cetearyl Alcohol, Behentrimonium Methosulfate, Panthenol, Glycerin, Lauryl Glucoside, Hydrolyzed Wheat Protein, Simmondsia Chinensis (Jojoba) Seed Oil, Glyceryl Laurate, Persea Gratissima (Avocado) Oil, Rice Amino Acids, Potassium Sorbate, Citric Acid, Sodium Gluconate, Tocopheryl Acetate, Anthyllis Vulneraria Flower Extract, Fusanus Spicatus Wood Oil, Lavandula Angustifolia (Lavender) Oil, Lecithin, Tocopherol, Ascorbyl Palmitate, Hydrogenated Palm Glycerides Citrate, Eugenia Caryophyllus (Clove) Leaf Oil, Linalool, Farnesol. For all over styling, apply sparingly to towel dried hair & massage into ends. Style as usual. Apply with fingertips and style as usual (scrunch, comb etc). 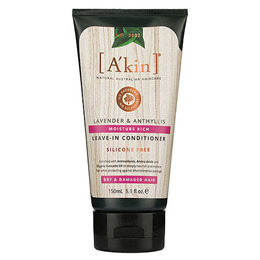 Below are reviews of A kin Lavender & Anthyllis Leave-In Conditioner - 150ml by bodykind customers. If you have tried this product we'd love to hear what you think so please leave a review. I first used this as a leave in conditioner and it left my hair quite dry. However, I didn't like the thought of wasting it, so I then started using it as a normal conditioner. I shampoo my hair then leave this conditioner on for 5 minutes or so and the results have been amazing. Sleek, moisturised hair. My hair is type 2c and is coarse and wavy. Love it! I have very short coloured hair. 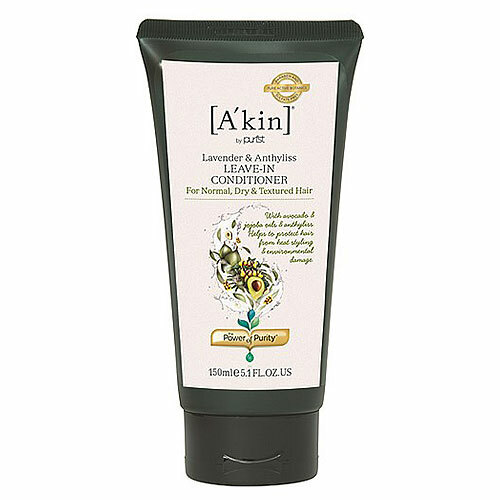 This Leave-In Conditioner is softening but gives it body. I can wear it totally flat and glistening as in 1920s, or dampening it slightly the next day, and wear it in spikes. This is a brilliant product. I can change my hair every day, but only wash it once a week! I'm still bright red and pink, in time for my next cut in five weeks. Amazing leave-in conditioner. I have bright red/pink hair which fades fast in sunlight. This conditioner protects hair colour and leaves it feeling soft. Also good for restyling by wetting hands and making changes. Recommended it everywhere! This product wasn't any good for my hair. I have used other products by this company and have been really pleased with them. Unfortunately this one didn't seem to condition my hair at all. Unique daily moisture care helps replace hair moisture, strengthens hair & has colour protective ingredients.